It’s been just over a year since China wowed the world with the first soft Moon landing in almost 40 years. The Chang’e-3 robotic lander made it all the way to Mare Imbrium (Sea of Rains) on Dec. 14, 2013, quickly deploying the Yutu rover for a spin. Mission updates have been sparse in recent months, but the Planetary Society and a forum on Unmanned Spaceflight recently pointed out a new image archive. These pictures are so high-definition, it’s almost as good as being on the Moon beside the rover. While some of the images are familiar to followers of the mission, what makes the image archive stick out is how high-definition many of them are. A few great shots have been sent back from the surface, including a set from January that was combined into a 360-degree panorama by Marco Di Lorenzo and Universe Today’s Ken Kremer. But this archive contains a wealth of them. The lander/rover team made it to the surface last year equipped with high-definition video cameras, prepared to catch some of the first new views of the lunar surface from close up since the Apollo robotic/human and Soviet robotic moon landing era of the 1960s and 1970s. While Chinese officials reportedly said the rover would last three months and the lander a year, difficulties quickly cropped up. Shortly before Yutu entered a planned hibernation for its second lunar night (about two weeks on Earth) in January, a technical problem was reported that was later identified as a problem with its solar panel. A “control circuit malfunction”, according to the Xinhua news agency, left the rover at risk of not waking up after that second hibernation. The mast it controlled was supposed to lower and protect some of the rover’s sensitive electronics. Yutu survived the night, but was left unable to move through the third lunar day. According to the Planetary Society (based on Chinese news media reports), there are no current status updates for Yutu, but Chang’e-3 is still working a year after the landing. It hasn’t been an easy few lunar months for the Yutu rover, which reportedly had problems positioning its solar panels in March while exploring the lunar surface. That said, reports are emerging that the rover is still alive. Along with those reports came a new panorama released in time for the Moon Festival in that country. As you can see in the video above, the new panorama shows the Chang’e-3 lander and the tracks of the Yutu rover in the Mare Imbrium (Sea of Rains). The duo landed on the Moon on Dec. 14, 2013, with the rover on the top. Yutu then drove on its six wheels on to the surface only about seven hours after the touchdown happened. Yutu Rover is back! X-Band carrier loud and clear – amazing! FFT @ http://t.co/JZaYaAYpjg No signals from Chang’e’3 lander though. This newly expanded timelapse composite view shows China’s Yutu moon rover at two positions passing by crater and heading south and away from the Chang’e-3 lunar landing site forever about a week after the Dec. 14, 2013 touchdown at Mare Imbrium. This cropped view was taken from the 360-degree timelapse panorama. See complete 360 degree landing site timelapse panorama herein and APOD Feb. 3, 2014. Chang’e-3 landers extreme ultraviolet (EUV) camera is at right, antenna at left. Credit: CNSA/Chinanews/Ken Kremer/Marco Di Lorenzo – kenkremer.com. KENNEDY SPACE CENTER, FL – China’s maiden moon rover Yutu awoke from her regular two week long slumber on Friday, March 14, to begin the 4th Lunar Day since the probes history making touchdown on the surface of Earth’s nearest neighbor in mid December 2013. But the endearing robot is still ailing and suffering from mechanical control issues that popped up in late January 2014 according to Chinese space officials. The Chang’e-3 mothership lander that deposited Yutu onto the pockmarked lunar surface also awoke two days earlier on Wednesday, March 12. “Yutu and the lander have restarted their operations and are exploring as scheduled,” according to China’s State Administration of Science, Technology and Industry for National Defence (SASTIND), responsible for executing the Chang’e-3 mission. However, “the control issues that have troubled Yutu since January remain,” says China’s government owned Xinhua news agency. The hugely popular ‘Yutu’ rover is still suffering from an inability to maneuver its life giving solar panels. It is also unable to activate its six wheels and move around the surface – as I reported here. 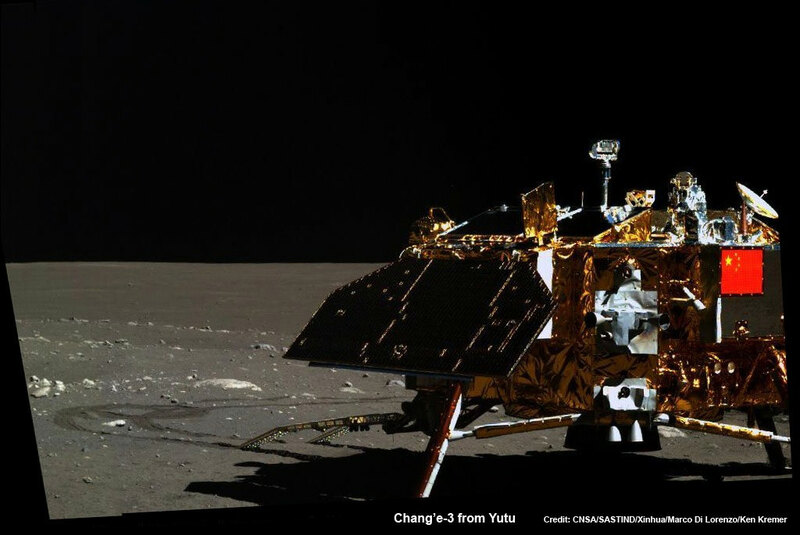 “The control circuit problem prevented Yutu from entering the second dormancy as planned,” said Ye Peijian, chief scientist of the Chang’e-3 program, in an exclusive interview with Xinhua. A functioning control circuit is required to lower the rovers mast and protect the delicate components and instruments mounted on the mast from directly suffering from the extremely harsh cold of the Moon’s recurring night time periods. “Normal dormancy needs Yutu to fold its mast and solar panels,” said Ye according to CCTV, China’s state run broadcaster. Fortunately, the panoramic camera, radar and other sciene instruments and equipment are functioning normally, says SASTIND. 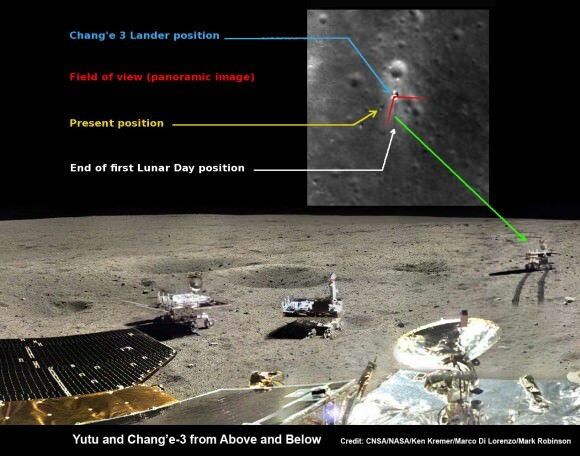 Yutu even snapped at least a pair new images of the lander during Lunar Day 3. See our mosaic of Yutu’s Lunar Day 3 lander image as well as our the complete 360 degree timelapse color panorama from Lunar Day 1 herein and at NASA APOD on Feb. 3, 2014 – assembled by Marco Di Lorenzo and Ken Kremer. By reawakening on March 14, the 140 kg robot also survived for its three month design lifetime on the moon. Yutu’s goal is to accomplish a roving expedition to investigate the moon’s surface composition and natural resources. So far the 1200 kg Chang’e-3 lander is functioning as planned during its first three lunar days, says SASTIND. “The lander’s optical telescope, extreme ultraviolet camera and lunar dust measurement device completed scheduled tasks and obtained a large amount of data,” says China’s government owned Xinhua news agency. 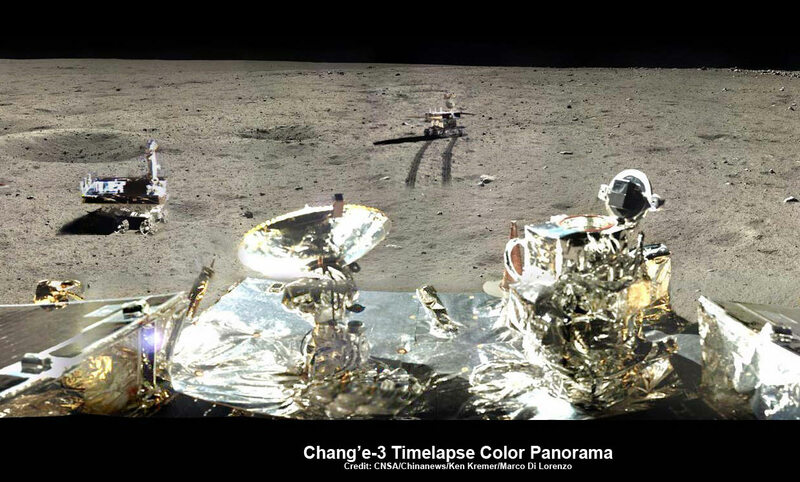 This time-lapse color panorama from China’s Chang’e-3 lander shows the Yutu rover at two different positions during its trek over the Moon’s surface at its landing site from Dec. 15-18, 2013. This view was taken from the 360-degree panorama. Credit: CNSA/Chinanews/Ken Kremer/Marco Di Lorenzo. The serious technical malfunction afflicting the life and continued operations of China’s Yutu moon rover since the start of its second Lunar Night time hibernation in late January 2014 has been identified as an inability to properly maneuver the life giving solar panels, according to a top Chinese space official. “Yutu suffered a control circuit malfunction in its driving unit,” according to a newly published report on March 1 by the state owned Xinhua news agency. “Normal dormancy needs Yutu to fold its mast and solar panels,” said Ye. The high gain communications antenna and the imaging cameras are attached to the mast. They must be folded down into a warmed electronics box to shield them from the damaging effects of the Moon’s nightfall when temperatures plunge dramatically to below minus 180 Celsius, or minus 292 degrees Fahrenheit. The solar panels also generate power during each Lunar day to keep the robot alive and conduct its mission of scientific exploration roving across the lunar terrain. The rover and Chang’e-3 stationary lander must power down and sleep during each lunar night since there is no sunlight available to generate power and no communications are possible with Earth. The panel driving unit also helps maneuver the panels into position to efficiently point to the sun to maximize the electrical output. “The driving unit malfunction prevented Yutu to do those actions” said Ye. Apparently the mast was not retracted and remained vertical during the lunar nights 2 and 3. And the camera somehow survived the harsh temperature decline and managed to continue operating since it snapped two images of the Chan’ge-3 lander during Lunar Day 3. See our two image mosaic – below. In addition to being chief scientist of the Chang’e-3 program Ye is also a member of the National Committee of the Chinese People’s Political Consultative Conference, the country’s top political advisory body. For a time in mid-February, mission scientists feared that Yutu would no longer function when because no signals were received until two days later than the planned “awakening” from Lunar Night 2 on Feb. 10. Fortunately, Yutu did finally wake up some 48 hours late on Feb. 12 and function on Lunar Day 3. And the team engaged in troubleshooting to try and identify and rectify the technical problems. Since then, Chinese space engineers engaged in troubleshooting to try and identify and rectify the technical problems in a race against time to find a solution before the start of Lunar Night 3. The 140 kilogram rover was unable to move during Lunar Day 3 due to the mechanical glitches. “Yutu only carried out fixed point observations during its third lunar day.” according to China’s State Administration of Science, Technology and Industry for National Defence (SASTIND), responsible for the mission. However it did complete some limited scientific observations. And fortunately the ground penetrating radar, panoramic and infrared imaging equipment all functioned normally. 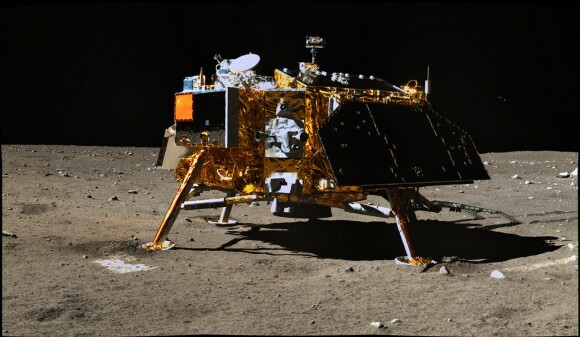 Yutu and the companion Chang’e-3 lander have again gone into sleep mode during Lunar Night 3 on Feb. 22 and Feb 23 respectively, local Beijing time. But the issue with the control circuit malfunction in its driving unit remains unresolved and still threatens the outlook for Yutu’s future exploration. 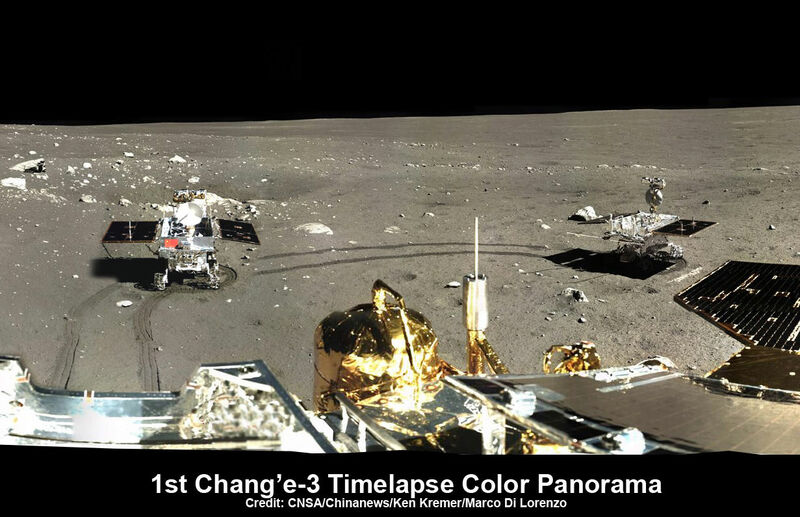 See our new Chang’e-3/Yutu lunar panoramas by Ken Kremer and Marco Di Lorenzo herein and at NASA APOD on Feb. 3, 2014. Yutu is now nearing its planned 3 month long life expectancy on a moon roving expedition to investigate the moon’s surface composition and natural resources. The 1200 kg stationary lander is functioning normally. It is as expected to return science data about the Moon and conduct telescopic observations of the Earth and celestial objects for at least one year. “We all wish it would be able to wake up again,” said Ye according to CCTV, China’s state run broadcaster. Ye will be reporting about Yutu and the Chang’e-3 mission at the annual session of the top advisory body, which opened today, Monday, March 3. Stay tuned here for Ken’s continuing Chang’e-3, Orion, Orbital Sciences, SpaceX, commercial space, Curiosity, GPM, LADEE, Mars and more planetary and human spaceflight news. Learn more at Ken’s upcoming presentations at the NEAF convention on April 12/13. The little ‘rabbit’ beloved worldwide has now phoned home and actually survived the perils of the long lunar night and is alive and awake to start a 3rd day of scientific exploration despite suffering a serious malfunction as it entered the latest hibernation period two weeks ago. “Yutu has come back to life!” said Pei Zhaoyu, the spokesperson for China’s lunar probe program, according to a breaking news report by the state owned Xinhua news agency. Yutu’s new lease on life also comes after Monday’s (Feb. 11) premature report of the robots demise by the state owned China News Service, reported here. However, “Yutu failed to power-up Monday [Feb 11] and data about its current condition and repair progress is still being collected and analyzed,” Xinhua and CCTV (China state run television) reported. This indicates that Yutu was in fact feared lost for some time by the mission team, until further efforts finally resulted in the detection of a signal from the spacecraft – and a welcome reversal of yesterdays news! The robot “has now been restored to its normal signal reception function,” says Pei. Earlier today (Feb. 12) amateur radio operators at UHF-satcom reported detection of a signal from Yutu. But much technical work remains ahead for the engineering and science teams to ascertain why it malfunctioned and whether the six wheeled rover can be restored to partial or full functionality. As night fell on Jan. 25, the rover entered its second two week long period of dormancy just as the rover “experienced a mechanical control abnormality,” according to a report by China’s official government newspaper, The People’s Daily. “Yutu went into sleep under an abnormal status,” Pei said. “The rover stands a chance of being saved now that it is still alive,” Pei stated. Definitive word about the Chang’e-3 lander has not yet been announced. But it is expected to survive since no malfunctions have been reported. It has a 1 year design lifetime. Xinhua stated that Chinese space officials will comment on the landers status soon. The inaugural pair of probes could be the forerunners to a manned Chinese Moon landing mission a decade from now. China’s current plans call for the Chang’e-4 Moon lander/rover to launch in 2016, perhaps with some upgrades and lessons learned from the ongoing mission.